Small, Surprising Dip In World's Carbon Emissions Traced To China Climate scientists say global emissions of carbon dioxide seem to have dipped a bit in 2015, though the world economy is still growing. China's reduced use of coal may be the main reason. 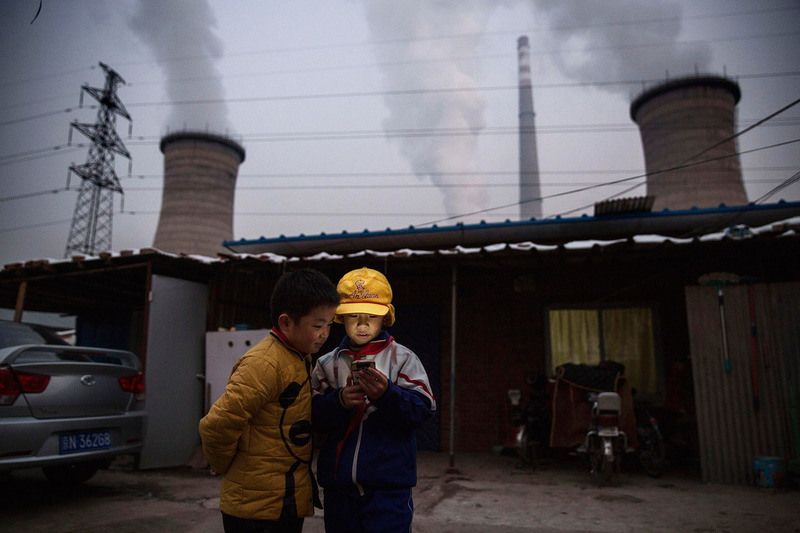 Young boys in Beijing check a smartphone in front of their home near a coal-fired power plant. As China's economy slowed in 2015, its industrial use of coal likely dropped, too, researchers say. That may be behind the slight drop in global CO2 emissions. Since the 1960s, scientists have tracked what's been an almost inexorable rise in the amount of CO2 in our atmosphere. It's the main contributor to global warming, so more CO2 means more warming. Last year, however, that rise apparently flattened out. And this year, CO2 emissions around the world actually seem to have dropped slightly, according to a paper published Monday in the journal Nature Climate Change. Climate scientist Rob Jackson from Stanford University says it's a small dip — less than 1 percent. Still, even that amount is significant. As economies surge they usually use more energy, Jackson says, which means they put out more CO2. But that's not what happened this year. "I was surprised by the result," he says. "Previously we've only seen this sort of thing when global economies were in crisis. That's the most exciting piece of this puzzle: We're seeing a flattening or decline in emissions at a time when the global economy is still growing robustly." Jackson and an international team used data from the Global Carbon Project, which tracks worldwide CO2 emissions, to come up with their result. Climate scientist Corinne Le Quere from the University of East Anglia, in the United Kingdom, says there's one main reason for the good news: "It's mostly down to China's use of coal," she says. China burns an enormous amount of coal — creating an enormous amount of CO2. 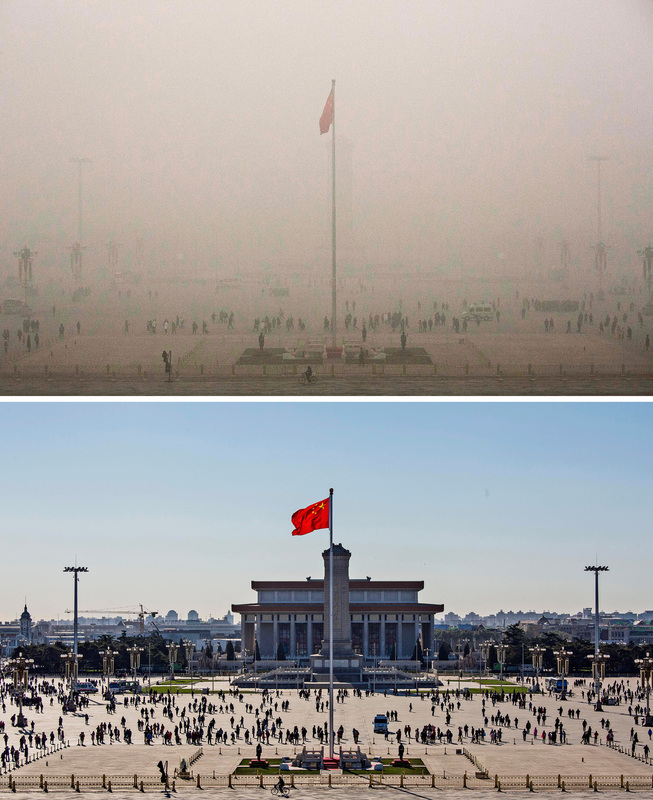 But as China has started to deal with its air pollution problem, and the country's economic growth has slowed, "all of a sudden, it looks like their use of coal in 2015 actually has gone down," Le Quere says. And China's CO2 emissions have, consequently, dropped a startling 4 percent this year. Worldwide, the total decline in emissions is much less — less than 1 percent. Still, it reverses a relentless increase the world has experienced over the past few years. The team notes in the published report that emissions from Western Europe and the U.S. have also flattened out. That's largely because of an increase in the amount of power coming from solar, wind and natural gas — instead of coal — in the U.S.
China's air pollution is legendary. Tiananmen Square, in Beijing, experienced what officials called its worst smog of the year on Dec. 1 (top), until a strong north wind dispersed the air pollution 24 hours later (bottom). But Le Quere says it's China, the world's biggest source of CO2, that will drive the ups and downs in the emissions numbers for the world in the near future. And no one should expect the downturn from China to last. "Whether the emissions are going to pick up again in China? I certainly think they will," Le Quere says, because China's economy is bound to revive. Also, it's worth remembering that the findings are based on emissions reports from China — which have not always been accurate. But John Holdren, the science adviser to the White House, says whether the decline is a blip or more lasting, it suggests that a real decline in emissions is within reach. "The global total should absolutely be going down after 2020," Holdren says, "so what we are seeing now is a good sign and should not be regarded as cause for false hope, but cause for real hope that the world is turning this around." Still, he says, "we'll need to do much more." The need is great because India will soon be the world's biggest source of CO2 instead of China, as India embraces coal to bring electricity to hundreds of millions of its citizens.